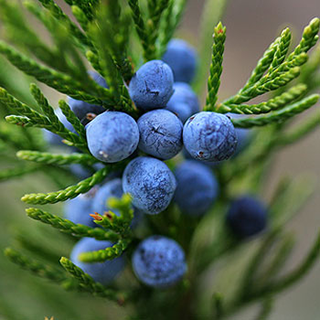 Native to Europe, North America, and many parts of Asia, juniper has long been associated with ritual cleansing and has been burned in various temples throughout history. Today the herb is mainly used as remedy for urinary disorders, while its essential oil is included in various massage rubs for muscle and joint pains. Take 20–40 drops (1–2ml) in a little water 3 times daily for urinary tract problems including cystitis, or to stimulate the digestion and ease flatulence. Infuse 1/2oz (15g) of crushed berries in 1 pint (600ml) of boiling water for 30 minutes and take 1/2–1 cup 3 times daily for gastric upsets, stomach chills, or period pains. The infusion can also be sipped during the first stages of labor. Use 10 drops of juniper essential oil in 2 tsp (10ml) of almond oil as a massage for arthritic pains. Use 10 drops of cade oil in 1 tbsp almond oil, add to 1 pint (600ml) of hot water, mix well, and apply for psoriasis affecting the scalp. Leave for 15 minutes or longer, and rinse thoroughly. Tolerates almost all conditions including both acid and alkaline soils, sun and partial shade or exposed positions, but dislikes water-logged soil. Usually grown from seed sown in a propagator in autumn or spring or by heeled cuttings in autumn. Grow until the plants are well established and can be moved to their final positions. Collect the “berries”—actually small cones—by shaking the branches over a ground cloth to dislodge them.